How To Celebrate Your New Year Party With Balloons? Between your personal and professional work, 2017 is about to end so quickly. And with another night of excitement, its time to prepare for the New Year Party coming ahead this season. Have you started thinking about the New Year Party celebration with balloons? 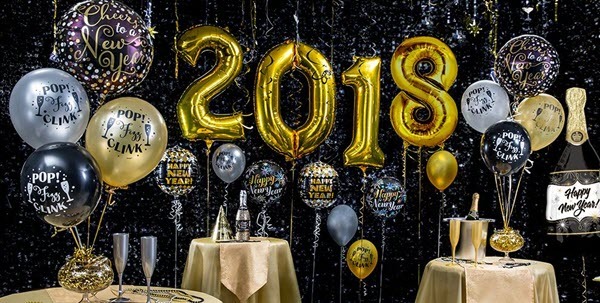 Don’t worry; we are here with some of the ideas to decorate your home using balloons that will not only make your night more special but will also give you a collection of some of the best memories of your past year. The welcoming year flowing down the balloon Well, this is one of the coolest ways to celebrate your New Year this time. All you need to do is to inflate a large-size balloon and hang below it, the colorful 2017 beautifully decorated with balloons. You can either decorate this balloon yourself or call up some professional who can do this job for you. You can inflate large-size balloons and inflate the colorful balloons using confetti’s, glowing sticks, sweets for kids, and many more accessories to embrace the beauty of balloons on your celebration day. You can then paste the cut out of the passing year to give a warm welcome to the year coming ahead. This is one of the beautiful ways to give a grand welcome to the year that will give you more happiness and prosperous life. All you need to do is to pick up balloon colors that can go well with your celebration event. Celebration means enjoying with your friends and family members. To keep memories of the celebration day, it is very important to create a photo booth that can give your guests, a perfect place to shoot beautiful pictures that last with them forever. New Year memories are special. They keep you connected with the years that pass away and the years that come and give you so much. You can create an eye-catching photo booth and use the same idea next year as well. Your guest would love this place and shoot most of their pictures here only. Colorful balloons are trendy. If you have some extra time, you can add some uniqueness to your balloons by either decorating them with colorful messages, quotes, the name of your guests, or any other thing or fill them with things like confetti. Ordinary balloons are easily available in the market. You can experiment your creativity with balloons and give them a completely new look. This would help you to throw an ultimate celebration party that your guest will remember until the next New Year. Above are some of the best ideas to celebrate your New Year Day with full zest. Hopefully, you will find this information useful and consider following these tips, the last day of this running year to welcome the coming year with full energy and happiness.